Resilience is more than just mindfulness and positivity. It is a set of skills that can be learned, and it helps people adapt and thrive in the midst of change. With meQuilibrium, you can equip each of your employees with the tools to master the skills to overcome any obstacle, increase agility, and gain adaptive capacity, while reducing stress, burnout, and absenteeism. 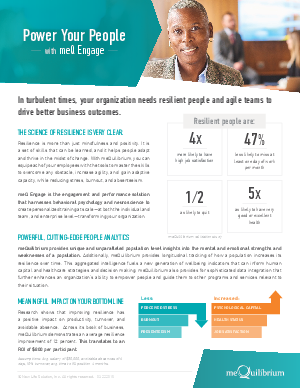 meQ Engage is the engagement and performance solution that harnesses behavioral psychology and neuroscience to create personalized training at scale—at both the individual and team, and enterprise level—transforming your organization.